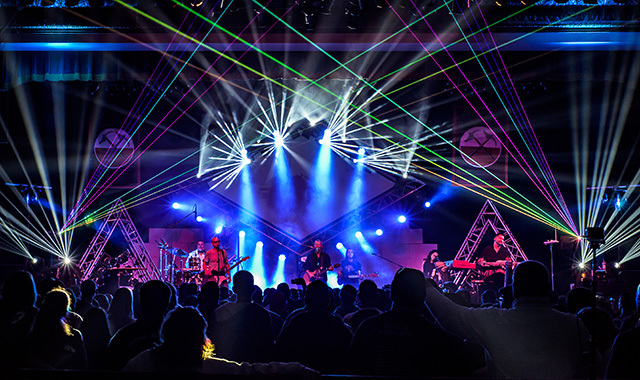 Pink Dryod pays tribute to Pink Floyd’s “The Wall,” complete with light and laser shows, on March 2 at Raue Center for the Arts in Crystal Lake. Through March 16, Thu.-Fri. 7:30 p.m., Sat. 3 & 7:30 p.m., Sun. 3 p.m. Agatha Christie’s famous mystery about a group of strangers stranded in an English country boarding house by a sudden snow storm. There is a murderer in their midst and everyone is a suspect. Metropolis Performing Arts Center, 111 W. Campbell St., Arlington Heights, (847) 577-2121, metropolisarts.com. Feb. 1 & March 1, 8 p.m. The Green Room’s Improvisers take audience suggestions and turn them into hilarious theater pieces right on stage. The Hemmens Cultural Center, 45 Symphony Way, Elgin, (847) 931-5900, hemmens.org. Feb. 1, 8:30 p.m. Mike Toomey, a regular performer on WGN Morning News, delivers quick wit with a unique style as well as dead-on impersonations. Raue Center for the Arts, 26 N. Williams St., Crystal Lake, (815) 356-9212, rauecenter.org. Feb. 2, 8 p.m. Join this duo with an evening of Irish song, stories and dance. Woodstock Opera House, 121 W. Van Buren St., Woodstock, (815) 338-5300, woodstockoperahouse.com. Feb. 2, 8 p.m. Affectionately known to his fans as New Jersey’s Bad Boy, Marino has performed in major comedy clubs nationwide and around the world. Arcada, 105 E. Main St., St. Charles, (630) 587-8400, arcadalive.com. Feb. 2, 8 p.m. Tina Naponelli captures the essence of Carole King with her powerful voice and soulful renditions of hits such as “Natural Woman” and “Feel the Earth Move” from the Tapestry album. Raue Center, Crystal Lake, (815) 356-9212, rauecenter.org. Feb. 2, 9:30 p.m. The reggae band performs Bob Marley and the Wailers hits, such as “Stir it Up,” “Get Up, Stand Up,” and “Buffalo Soldier.” Arcada, St. Charles, (630) 587-8400, arcadalive.com. Feb. 3, 3 p.m. The 21-year old virtuoso pianist, who has performed on five continents, performs a classical piano recital. Barrington’s White House, 145 W. Main St., Barrington, (224) 512-4115, barringtonswhitehouse.com. Feb. 3, 5 p.m. The original tribute from London’s West End takes you back in time by re-creating one of most popular groups in a live stage performance. Arcada, St. Charles, (630) 587-8400, arcadalive.com. Feb. 6-March 17, Wed. 1:30 & 7 p.m., Thu. 7 p.m., Fri. 8 p.m., Sat. 3 & 8 p.m., Sun. 1 & 5:30 p.m. Enjoy Mel Brooks’ comedy hit about has-been producer Max Bialystock, who concocts one of the biggest cons in musical theater history, trying to make money with a guaranteed flop. Paramount Theatre, 23 E. Galena Blvd., Aurora, (630) 896-6666, paramountaurora.com. Feb. 7, 2:15 p.m. Comprised of a unique mix of instruments, including the flute, alto flute, violin, viola, guitar and cello, the quartet performs works by Shubert, Italian Baroque composer Pietro Locatelli, and French guitarist Jean-Michel Coquery, among others. Morton Arboretum, 4100 Ill. Rt. 53, Lisle, (630) 968-0074, mortonarb.org. Feb. 8, 7:30 p.m. Brinkman returns with his Valentine’s show, “Share the Love,” with songs such as “Love of my Life” and “The Gift.” Batavia Fine Arts Centre, 1401 W. Wilson St., Batavia, (630) 937-8930, bataviafineartscentre.org. Feb. 8, 8 p.m. A mixture of blues, country gospel and English invasion equals Southern Rock. Arcada, St. Charles, (630) 587-8400, arcadalive.com. Feb. 8, 8 p.m. Charles Ross entertains with his irreverent parody and homage in “One Man Dark Knight,” covering Batman’s origins to his epic battles against Gotham’s supervillains. Raue Center, Crystal Lake, (815) 356-9212, rauecenter.org. Feb. 8 & March 15, 7:30 p.m. Get a behind-the-scenes glimpse of the dress rehearsal for the next evening’s concert. Watch the orchestra at work for the first hour, then check out the instrument petting zoo, followed by refreshments. RSVP. DuPage Symphony Orchestra (DSO), Wentz Concert Hall, North Central College, 171 E. Chicago Ave., Naperville, (630) 778-1003, dupagesymphony.org. Feb. 9, 3 p.m. In this whirlwind solo show, Charles Ross retells the classic trilogy in 60 minutes, including all the characters, music, ships and battles. Raue Center, Crystal Lake, (815) 356-9212, rauecenter.org. Feb. 9, 6:30 p.m., pre-concert lecture; concert 7:30 p.m. Featuring Beethoven’s “Overture to Fidelio,” “Op. 72 and “Violin Concerto in D Major,” “Op. 61” as well as Dvorák’s “Symphony No. 6 in D Major, Op. 60” with soloist YooJin Jang, Concert Artists Guild Competition Winner. Wentz Concert Hall, North Central College, Naperville, (630) 778-1003, dupagesymphony.org. Feb. 9, 8 p.m. A cabaret of Broadway’s greatest hits from yesterday and today. Woodstock Opera House, Woodstock, (815) 338-5300, woodstockoperahouse.com. Feb. 9, 8 p.m. The three-hour tribute show captures the sound and spirit of Santana, whose hits include “Oye Coma Va,” “Black Magic Woman” and “Soul Sacrifice.” Arcada, St. Charles, (630) 587-8400, arcadalive.com. Feb. 9, 8 p.m. Journey through the trilogy in one hour as Charles Ross re-creates the world of Middle-Earth. Raue Center, Crystal Lake, (815) 356-9212, rauecenter.org. Feb. 9-10, Sat. 7:30 p.m., Sun. 2:30 p.m. Pianist Natasha Paremski is featured in this program including Brahms’ “Academic Festival Overture,” “Chopin’s Piano Concerto No. 2” and “Schuman’s Symphony No. 4.” Hemmens, Elgin. Tickets: ESO: (847) 888-4000, elginsymphony.org. Feb. 10, 7:30 p.m. Young piano virtuoso and Berklee College of Music graduate Tomáš Kačo presents his new album “My Home,” featuring his own arrangements and compositions, and a unique fusion of classical, jazz and gypsy music. Metropolis, Arlington Heights, (847) 577-2121, metropolisarts.com. Feb. 15, 7:30 p.m. A salute to the Everly Brothers including hits such as “Bye Bye Love,” “Wake Up Little Susie” and “Let It Be Me.” Blizzard Theatre, Elgin Community College Arts Center, 1700 Spartan Dr., Elgin, (847) 622-0300, elgin.edu. Feb. 15, 8 p.m. The all-star tribute to Santana includes everything from the classic early hits to the “Supernatural” Grammy songs and everything in between. Raue Center, Crystal Lake, (815) 356-9212, rauecenter.org. Feb. 15-16, 8 p.m. Barrington’s own McKillen returns to share his acoustic guitar songs of love, childhood and his Irish roots. Barrington’s White House, Barrington, (224) 512-4115, barringtonswhitehouse.com. Feb. 16, 7 p.m. With 50 years of artistry and 50 albums to her credit, Judy Collins inspires audiences with her sublime vocals. Raue Center, Crystal Lake, (815) 356-9212, rauecenter.org. Feb. 16, 8 p.m. Stand-up comedian and actress Rhea plays in top comedy clubs across the U.S. and Canada. Woodstock Opera House, Woodstock, (815) 338-5300, woodstockoperahouse.com. Feb. 17, 2 p.m. Pianists perform “Tales from the East,” stories of romance and adventure by Russian composers: Borodin, Rimsky-Korsakoff, Prokofiev and Stravinsky. Gail Borden Public Library, 270 N. Grove Ave., Elgin, (847) 742-2411, gailborden.info. Feb. 17, 2:30 p.m. One of the leading player/composers in the flute world. Fermilab, Ramsey Auditorium, Kirk Road & Pine Street, Batavia, (630) 840-2787, fnal.gov/culture. Feb. 19, 10 a.m. & 12:15 p.m. Sally and her brother meet the most mischievous cat with some crazy ideas to turn a rainy afternoon into an adventure. What will Mom find when she comes home? Grades K-4. Raue Center, Crystal Lake, (815) 356-9212, rauecenter.org. Feb. 21, 12:15 p.m. Children from preschool through grade 3 enjoy the tale of a young Parisian girl who gets off on the wrong foot with a mischievous new neighbor and learns that first impressions aren’t everything. Raue Center, Crystal Lake, (815) 356-9212, rauecenter.org. Feb. 21, 7:30 p.m. Stand-up comedy by the former Saturday Night Live writer and actor. Arcada, St. Charles, (630) 587-8400, arcadalive.com. Feb. 22, 6 p.m. Join detective Paddy O’Furniture as he finds out who has eliminated the favorite contestant in a reality TV talent competition, right onstage. Is it a jilted lover, a jealous businessman or an audience member? Metropolis, Arlington Heights, (847) 577-2121, metropolisarts.com. Feb. 22, 8 p.m. After releasing his first platinum record at 15 years old, Lang has gone on to enjoy two more decades as a blues artist. Arcada, St. Charles, (630) 587-8400, arcadalive.com. Feb. 22-March 17, Fri.-Sat. 8 p.m., Sun. 3 p.m. Lives are upended when a real estate developer threatens to buy Citron Court Trailer Park; a comedy-drama of loss and love. Steel Beam Theatre, 111 S. Main St., St. Charles, (630) 587-8521, steelbeamtheatre.com. Feb. 23, 8 p.m. Playing Afro-Mexican beats and rhythms, the group delivers inspiring lyrics that document stories of a community seeking love and justice in the concrete jungle of Los Angeles. Fermilab, Batavia, (630) 840-2787, fnal.gov/culture. Feb. 23, 8 p.m. Immerse yourself in the sounds, sets, costumes and visual effects inspired by Pink Floyd. Arcada, St. Charles, (630) 587-8400, arcadalive.com. Feb. 24, 3 p.m. Canadian soprano Solange Sior and Italian tenor Franco Martorana are joined by Ukrainian soprano Tatyana Torzhevska, Korean tenor Simon Kyung Lee and pianist Chiayi Lee for a performance featuring operatic excerpts, musical theater favorites, Viennese waltzes, popular music and folk songs from around the world. Norris Cultural Arts Center, 1040 Dunham Road, St. Charles, (630) 584-7200, norrisculturalarts.com. Feb. 26, 7:30 p.m. Nashville-based progressive rock musician Morse and band stop off on their world tour to play from their recently released album, “The Great Adventure.” Arcada, St. Charles, (630) 587-8400, arcadalive.com. Feb. 27, 7:30 p.m. Broadway entertainer Gregory sings solid gold Motown hits including “My Girl,” “Higher and Higher” and “Heard it Through the Grapevine.” Metropolis, Arlington Heights, (847) 577-2121, metropolisarts.com. Feb. 28, 10 a.m. The musical adventures of everyone’s favorite first-grader, based on the books by Barbara Park. Grades K-5. Raue Center, Crystal Lake, (815) 356-9212, rauecenter.org. March 1, 8 p.m. Featuring the “Bat Out of Hell” album with American Idol winner Caleb Johnson. Arcada, St. Charles, (630) 587-8400, arcadalive.com. March 1-23, Thu.-Sat. 8 p.m., Sat.-Sun. 2 p.m. Featuring the characters and songs from Disney’s “Beauty and the Beast.” TownSquare Players, 121 Van Buren St., Woodstock, (815) 338-5300, townsquareplayers.org. March 2, 8 p.m. With nearly 50 years on the Southern Rock scene and 15 albums under their belts, the band entertains with classic rock. Arcada, St. Charles, (630) 587-8400, arcadalive.com. March 2, 8 p.m. This tribute to Pink Floyd brings the look, feel and sound of “The Wall,” complete with light and laser shows. Raue Center, Crystal Lake, (815) 356-9212, rauecenter.org. March 2-3, Sat. 7:30 p.m., Sun. 2:30 p.m. Guitarist Jason Vieaux is featured; Smetana’s The Moldau, Villa-Lobos’ Concerto for Guitar and Small Orchestra, Corigliano’s Troubadours and Tchaikovsky’s Francesca da Rimini. Hemmens, Elgin. Tickets: ESO: (847) 888-4000, elginsymphony.org. March 3, 2 p.m. This Chinese acrobatic touring company presents a show combining award-winning acrobatics, traditional dance, spectacular costumes, ancient and contemporary music and theatrical techniques. Prairie Center for the Arts, 201 Schaumburg Court, Schaumburg, (847) 895-3600, prairiecenter.org. March 3, 3 p.m. The Fox Valley Concert Band performs music of American composers. Norris Center, St. Charles, (630) 584-7200, norrisculturalarts.com. March 3, 5 p.m. Hand-picked by Louise Harrison, George’s sister, the Liverpool Legends celebrate 50 years of Abbey Road. Arcada, St. Charles, (630) 587-8400, arcadalive.com. March 8, 8 p.m. Enjoy a trip down memory lane with songs played to the standard set by McCartney in the early 1970s. Arcada, St. Charles, (630) 587-8400, arcadalive.com. March 9, 8 p.m. A tribute to the superstar R&B group Earth, Wind and Fire, covering the playlist of the band’s top-charting hits. Raue Center, Crystal Lake, (815) 356-9212, rauecenter.org. March 9, 8 p.m. Back for a repeat performance, the internationally known band plays traditional Irish instrumental music. Fermilab, Batavia, (630) 840-2787, fnal.gov/culture. March 10, 2 p.m. Families with children in grades 2-5 enjoy an introduction to the world of orchestra music through a one-hour program featuring a performance of Benjamin Britten’s “Young Person’s Guide to the Orchestra,” enhanced by video projections and live narration. Schaumburg Youth Symphony Orchestra, Prairie Center, Schaumburg, (847) 895-3600, prairecenter.org. March 10, 2, 4:30 & 7:30 p.m. The 43rd season of concerts by the Elgin Youth Symphony Orchestra draws inspiration from Antoine de Saint-Exupéry’s quote, “What is essential is invisible to the eye” and explores the ways art makes us see what matters most about our humanity. Blizzard Theatre, Elgin Community College Arts Center, 1700 Spartan Dr., Elgin, (847) 622-0300, tickets.elgin.edu. March 15, 7:30 p.m. A family-friendly, high-energy experience with a band that uses ordinary objects to create “junk rock music.” Barrington’s White House, Barrington, (224) 512-4115, barringtonswhitehouse.com. March 15, 8 p.m. Lots of energy and musicianship define this timeless band. Arcada, St. Charles, (630) 587-8400, arcadalive.com. March 16, pre-concert lecture 6:30 p.m., concert 7:30 p.m. Featuring “Irish Rhapsody No. 1,” “Op. 78 Symphony No.1 in E minor,” and “Op. 32, Gaelic.” DSO, Wentz Concert Hall, North Central College, Naperville, (630) 778-1003, dupagesymphony.org. March 16, 7:30 p.m. Crowell’s latest album, “Close Ties,” looks back at his long and varied career as part of the Nashville music scene. Blizzard Theatre, Elgin Community College Arts Center, Elgin, (847) 622-0300, tickets.elgin.edu. March 17, 3 p.m. The quartet plays classical, jazz and contemporary music. Barrington’s White House, Barrington, (224) 512-4115, barringtonswhitehouse.com. This entry was posted on Tuesday, January 29th, 2019 at 11:57 am	and is filed under Arts & Entertainment. You can follow any responses to this entry through the RSS 2.0 feed. Both comments and pings are currently closed.